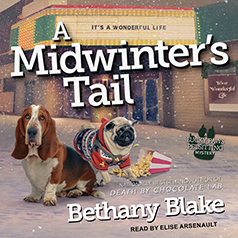 Bethany Blake presents the fourth book in her Lucky Paws Petsitting Mystery series. Professional pet sitter Daphne Templeton loves the holidays in Sylvan Creek, Pennsylvania. And nothing gets her into the spirit more than the town's annual Bark the Halls Ball. The whole community will be there to wag their tails, especially this year's special guest—Celeste "CeeCee" French, founder of a national chain of pet care franchises, who's returning home to announce plans for a bright new flagship store. But not everyone's celebrating CeeCee's homecoming. Daphne's friend Moxie Bloom, owner of Spa and Paw, a unique salon for people and their pets, has plenty to growl about. So when CeeCee is found face down under Sylvan Creek's town Christmas tree, stabbed with a distinctive pair of professional-grade pet shears, suspicion lands squarely on Moxie. Despite Daphne's promises to Detective Jonathan Black, she quickly reprises her role as amateur sleuth. Ably assisted by her basset hound sidekick, Socrates, she must hurry to prove her friend's innocence before a killer barks again . . .